In the widest terms, the label of “The Migration Period” is applied to the period between the early 4th and late 8th century which saw the massive movements of entire nations across the whole of Europe, leading ultimately to the formation of the states of modern Europe as the migrants moved into new territories, often filling the power vacuum that was developing as centralised Imperial control weakened in the provinces of the Roman Empire. This mass movement was of such magnitude that it’s cause cannot be attributed to a single factor, although some historians have tried. Rather it was the coming together of a number of factors that led to the movement and displacement of millions of people. Population growth in conjunction with a rise in sea levels (both a result of the global warming which is a feature of the late Roman period) meant that some sort of shifting and expansion of tribes and tribal territories was inevitable. The weakening of the Roman political and military structure provided the opportunity and incentive for smaller tribal groups to come together in order to establish themselves as the new dominant powers in a region, sometimes relatively peacefully (as was the case with the Franks in the Gallo-Roman regions), sometimes less so (such as the Gothic movements into Italy and Spain). Another key factor in both the timing of and direction taken by the migrants was the westward push by the Huns who were first encountered in Europe by the Visigoths in 358AD. The Hun invasion saw large numbers of ‘barbarians’ seek refuge in the Roman Empire and ultimately led to them crossing the Rhine in vast numbers in 405 or 406AD, an event that is usually seen as a massive and catastrophic event in the decline of the Western Roman Empire. Even the Mare Germanicum was no barrier to those wishing to leave or being driven out of their homelands. 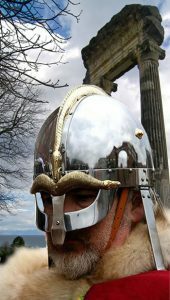 Germanic troops had been serving in Britain since the conquest of 43AD and there numbers had increased since the mid –3rd Century, serving both as regular auxiliary forces and as settled laeti or foederati. 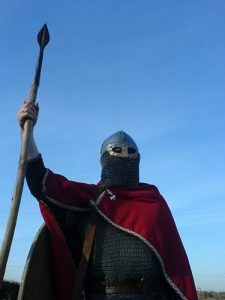 In the 4th century, substantial numbers of Alemanni were settled in Britain under the command of one of their own kings, Froamar (some of their duties being to defend the coastline from raids by Germanic pirates) . With a large Germanic presence already in place and presumably in contact with those still living in the old homelands, it’s no surprise that, as rising sea levels and aggressive invaders threatened those living in the marshes and artificial ‘mound’ settlements of the northern Germanic coastline, they should look to the island across the water as a desirable prospect. It is difficult to establish when these peoples, the Angles, Saxons, Jutes and Fresians (often referred to collectively as “Anglo-Saxons”), began to migrate and settle of their own volition rather than being settled deliberately by the Roman-British administration but it is certain that, by the mid 5th ce ntury, extensive settlement had taken place along the coast from the Humber to the Thames and that by the end of that century the migrants had occupied much of Kent and the South coast. The ‘Advent of the Saxons’ as it has been called is shrouded in folklore, legends and conflicting accounts but the archaeological evidence both in Britain (where grave finds of pagan Germanic artifacts allow us to trace the migration of the invaders culture if nothing else) and in their homelands (where many settlements seem to have been deserted en-masse almost overnight) supports the idea that this was a migration in the true sense, rather than just the movement of a warrior elite, imposing its ‘English’ culture, values and language on the citizens of Britannia. Powered by Newp WordPress Theme. © 2019 Britannia. All Rights Reserved.